Home to some 13 million people and boasting a history that dates back centuries, it’s easy to see why so many travelers pick London as a must-see stop when visiting England or Europe. The fact that six major airports are located within close proximity of England’s capital city doesn’t hurt when it comes to tourism, either. As a major hub for arts, education, fashion, business and just about every other professional business sector, London is New York City cranked up a few more notches. According to travel guide Andy Berke, getting around London to see the one-of-a-kind vistas that the city proper and its surrounding metropolitan areas offer isn’t as daunting as it may seem. In this article, we’ll explore modes of transportation in and around London so that your travels are a little easier and sight-seeing trips all the more enjoyable. Upon your arrival: If possible, leaving whichever airport by the Underground rail system is typically the most convenient. At most, it’s a 20-minute ride by train on the Heathrow Express line from Heathrow Airport to Paddington Station in London. If you’re landing in London City Airport, the Docklands Light Railway can connect you with the main Underground rail system. Travel guide Andy Berke notes that while taxi cabs waiting at the airport may seem convenient, they metered costs quickly escalate. Getting around: Again, the London Underground rail system offers the most popular way of travel even within city limits – which amount to a rather large 3,000-square-miles. Buses, especially the iconic double decker ones, can be caught by waiting at the marked stops that often have shelters. If you’re looking for a scenic tour, opt for the bus over the underground rail resources, travel agent Andy Berke says. Grab a map, pick a destination and see if there’s a public transportation route that runs by it. Staying over: Given London’s status as a must-see city, spending any significant amount of time there is going to add up. According to The Guardian newspaper, there are plenty of options afforded to tourists of varying budgets who need a place to spend the night. The YHA chain of hostels is almost always the most wallet-friendly, but the communal living space might night be for everyone. According to the newspaper, there are quite a few hotels explicitly marketing themselves as party spaces but there are plenty of bona fide hotels that will charge you hundreds of dollars per night for the privacy that hostels don’t have. 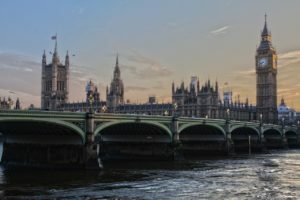 Getting out: If London is but one stop on your European vacation, there are a few logical destinations from here and a handful of ways to get there. The “Chunnel” is an underground rail line that can offer trips from London to Paris, France in about two hours, says travel agent Andy Berke. For those who’d rather not travel through the English Channel, numerous ferry companies can get you to the south of France, but often eat up at least eight hours of vacation time.